With the new academic year upon us, now is the time when our tutors weekly slots start to fill up, particularly for our Maths Tutors, English Tutors and Science (Chemistry, Physics and Biology) Tutors. Therefore if you feel that you could benefit from the help of one of our tutors, please do not hesitate to place an enquiry by clicking here. York Tuition provides tutors (all of whom are fully qualified schoolteachers) for Maths, Further Maths, English, Science, Biology, Chemistry, Physics, Primary and all of the humanities. Our tutors are all local to York and teach at all levels of the curriculum, from Primary to GCSE, all the way through to A Level and beyond. 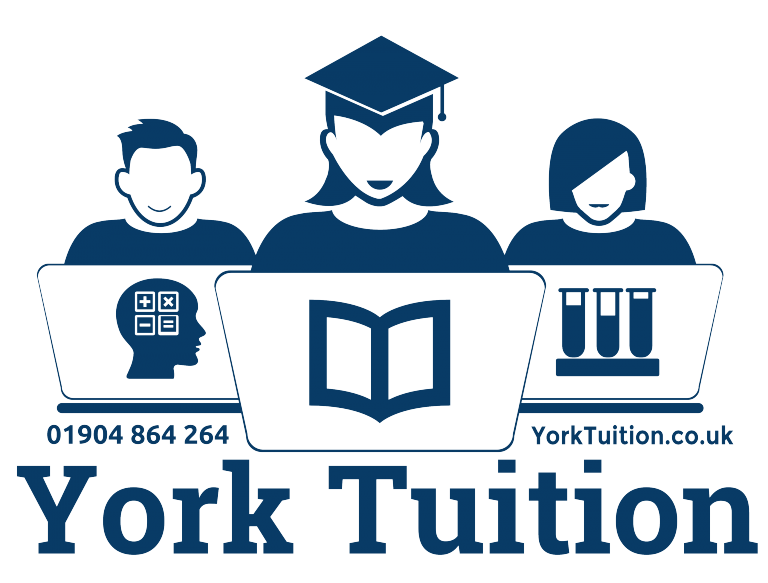 York Tuition provide tutors for all subjects and has been established in York since 2009. The service is run by York A Level Maths and Further Maths tutor John Armstrong. In this time we have earned the reputation of being the premier tutoring service in York. Our prime focus is quality tuition. To ensure this high quality, all of our tuition is delivered by fully-qualified schoolteachers all local to York. All lessons (unless otherwise requested) are performed on a one-to-one basis, allowing our tutors to tailor each session to the individual student's needs. All tutors are fully-DBS checked and experts in their subject. The one-to-one relationship between a tutor and student is imperative to ensure that maximal progress is made. When you enquire, we will talk to you about the student's individual needs and work with you to match them up with a tutor who has the right skill set, qualifications and personality to help them progress. There are many different reasons you would want to book a lesson with one of our tutors. Maybe your child is struggling at school and just needs a bit of a boost to get back on track. It could be that they have just started A Levels and are finding it difficult to make the transition between A Level and GCSE. You possibly want a tutor to help you get that extra GCSE qualification you need to apply for your dream job. Whatever your reason for needing a tutor, we are here to help. For the quickest response, fill in an online enquiry form by clicking here or by clicking the button below. These details help us build a list of suitable tutors in advance of us calling you back, saving you much time and effort. Once we have your details, you will receive a callback within 24 hours to discuss suitable tutors based on your needs. It really is that simple! Alternatively, call us on (01904) 864 264. It really is that simple. Our tutor pricing structure is simple. No formal contracts so lessons are arranged on a week-by-week basis. When possible, we do ask for 48hrs notice for cancellations. We provide tutors for all the main subjects at Primary (Key Stage 1 and Key Stage 2) Key Stage 3, GCSE, A Level and Degree Level. We have tutors available for Maths, Further Maths, Science, Biology, Chemistry, Physics, English Tutors, Primary, Dyslexia, QTS Skills Tests and many more. If your subject is not listed here, please do contact us and we still may be able to help you find a suitable tutor. Click the button below to fill in an online enquiry form, or call us. All tutors are fully qualified teachers local to York and hold a relevant teaching qualification and DBS certificate. We are a locally run service and collaborate with many independent tutors. This gives you a much wider choice of tutors than elsewhere. Customer testimonials about our tutors speak for themselves. The video below gives information on how our simple 3-step process for booking a tutor works. It couldn't be easier! John Armstrong, our Head Tutor runs A Level Maths and Further Maths revision classes at different times during the year. More information will be posted about these classes around December 2017. These classes have been extremely popular over the last few years so interest should be registered early to avoid disappointment. Visit ALevelMathsRevision.com for further information. Our tutors cover the areas in and around York, including (but not limited to) Acomb, Bishopthorpe, Bootham, Clifton, Clifton Moor, Copmanthorpe, Dunnington, Earswick, Easingwold, Elvington, Fulford, Haxby, Heslington, Heworth, Holgate, Huntington, New Earswick, Poppleton, Osbaldwick, Rawcliffe, Skelton, Stockton-on-the Forest, Strensall, Tadcaster, Wheldrake, Wigginton, etc. Our fees include travel costs to within 1 village outside of the outer ring road, however, travel further afield may incur an extra cost or require lessons to be slightly longer for practical reasons.